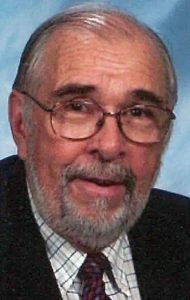 David Willoughby, 86, formerly of Elizabethtown, PA, passed away peacefully Wednesday evening, March 20, 2019, at Brethren Village in Lititz. David was born in Harrisburg on February 23, 1933. He was one of six children born to William A. and Lilian (Falkenstein) Willoughby. David was the beloved husband of Barbara (English) Maris. On December 30, 2018, they celebrated 29 years of marriage. David married Joyce Hoover, one of three children of Lawrence Hoover and Muriel Frysinger (later Saylor), on August 23, 1956. Dave and Joyce had four daughters, Sharon Willoughby and Sylvia Owen, both of Houston, TX, Cindy Roberts (Ron) of Hobbs, NM, and Suzy Willoughby of San Diego, CA. David graduated from John Harris High School. He attended Elizabethtown College and obtained degrees from Lebanon Valley College, Miami University of Ohio, and Eastman School of Music (University of Rochester). As a music professor, he held positions at Elizabethtown College, Eastern New Mexico University, where he was Dean of Fine Arts, and Susquehanna University. He worked with the Contemporary Music Project from 1970-1973. This innovative educational project was funded by the Ford Foundation. During his 20 years at ENMU, he presented a weekly public radio program, The Red Back Book, featuring a wide diversity of musical styles from around the world. Dr. Willoughby served as president of The College Music Society, directed several national CMS workshops, and edited the CMS newsletter for many years. He authored eight editions of the college textbook “The World of Music”, presenting a global approach to music of various cultures. David was a longtime member of Elizabethtown Church of the Brethren and held the position of Director of Music. He played double bass in the Roswell, NM and Hershey, PA symphonies. He enjoyed taking photographs, playing racquetball and golf, camping, and traveling across the U.S. and abroad. While living in Portales, NM and Elizabethtown, PA, he was an active member of Rotary International. In addition to his wife Barbara, David is survived by his four daughters, and two step-daughters, Elizabeth Maris (Howard Baum) of The Bronx, NY, and Cathy Maris (Dave Reiner) of Houston, TX. Also surviving is sister-in-law, Marie (Don) Willoughby; twelve grandchildren, Louis Gonzales (Danielle), Jennifer Willoughby, Daniel Willoughby (Nicky), Justin Roberts, Erin Allen (Daniel), Kristin Draper (Trey), Karalyn Roberts, Mindy, Tyler and Steven Nelissen, and Sarah and Abby Baum; and five great-grandchildren Alexis, Dimitri, Zoe, Callia and Riley. In addition to Dave’s parents, he was predeceased by brothers Bill, Bob, Jim, and Don Willoughby, sister Evelyn Bortner, and son-in-law Dave Owen. Memorial services will be held at a later date. Memorial contributions in Dave’s memory may be offered to the Brethren Village Good Samaritan Fund, 3001 Lititz Pike, Lititz, PA, 17543, Elizabethtown Church of the Brethren, 777 S Mt Joy St., Elizabethtown, PA 17022, or Hospice and Community Care, 685 Good Dr., Lancaster, PA 17604. Sending you peace, love, and light during this time. May you find comfort in remembering the beauty that Dave brought this world–both with his music and his smile. I knew Dave through the Hershey Symphony. Dr Dackow, our long time music director, praised him for his achievements in the field of music Ed. He was a humble and unassuming man who played a mean bass and whose wife Barbara was an adjudicator for our Young Artist Competition for many years. My heartfelt sympathy to Barbara and to Dave’s family. Mike Rusli.